Vietnam’s agriculture sector needs to end the practice of small-scale production and reorganize it on a larger scale towards high-tech agriculture, the “Reorganizing Agricultural Production” seminar, held prior to the second Vietnam Private Sector Forum (VPSF) at the end of this month, heard. Mr. Tran Manh Bao, Chairman of VPSF’s Agriculture Working Group and the Thai Binh Seed Company, told the seminar that Vietnam’s agricultural production needs to be reorganized with a greater focus on businesses rather than farmers. What businesses need is support in administrative procedures on land, taxes, and technology. “Investment in agriculture is risky, so tax policies should be improved,” he said. One of the most important issues relates to markets, according to Mr. Nguyen Khac Hai, CEO of the PAN Group. Domestic enterprises have little knowledge about foreign markets, so the government should introduce mechanisms for cooperation and exchanges of experience. 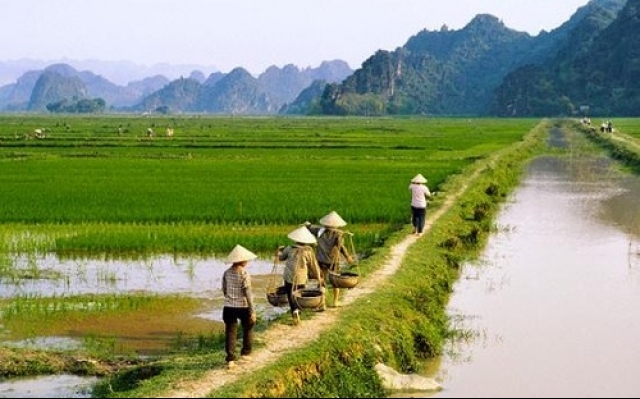 Mr. Nguyen Hoang Anh, General Director of the Central Fisheries Investment Company, said that, to reorganize production, there must be clear plans for agricultural development. There should also be a clear set of criteria in each agricultural sector and appropriate mechanisms and policies for each field. “In my 20 years in the fisheries industry, I have found that business support policies are far different in reality,” he said. “The policy mechanism for application is also incorrect.” Reorganizing agricultural production and developing a set of criteria for high-tech agriculture development is important, he emphasized. The second VPSF is to take place in Hanoi at the end of this month and will be chaired by Prime Minister Nguyen Xuan Phuc and attended by leaders from the government, departments, international organizations, and business associations. The VPSF is an initiative from the Vietnam Young Entrepreneurs’ Association and the Mekong Business Initiative (MBI), funded by the Asian Development Bank (ADB) and the Australian Government.